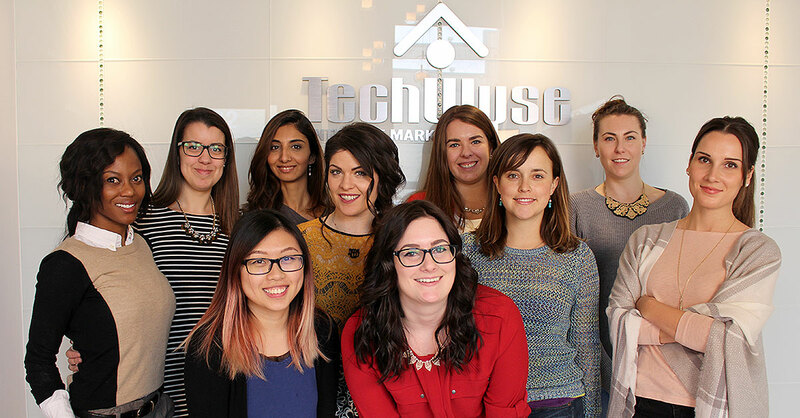 Happy International Women's Day From The Women Of TechWyse! Happy International Women’s Day From The Women Of TechWyse! In 2014, Google announced that only 30% of its employees were women, with only 21% of leadership positions in the company being held by women. Other major digital companies aren’t doing much better—Yahoo’s latest numbers of its workforce show that 37% of its employees are women, while Facebook is at 32%, and LinkedIn is 39% women. 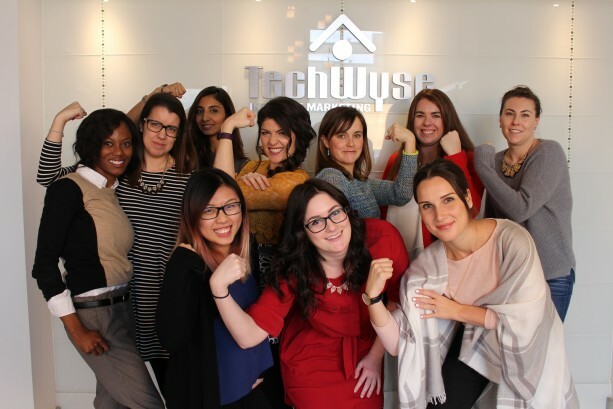 We are beyond proud to announce that at TechWyse, 44% of our staff in Canada are women. As we edge closer to a 50/50 ratio at TechWyse, it’s also worth noting that the women on our team have a wide range of professional backgrounds and many years of digital experience between them. To celebrate that achievement in diversity, several women at TechWyse reflected on the inspiration or motivation that led them to a career in digital marketing. We don’t have all the answers for why other digital companies are lagging in gender diversity, but we do know that the company culture here is one that values the strengths that women have to offer. We all took a different path to get here—some of us were self-taught, some were inspired to get into the field by a female role model, and others fell into it unexpectedly and have no plans of leaving. I was first drawn to digital work a few years ago when I realized that online strategy was the future. At the time, I was already passionate about all things marketing and strategic growth in general, and given the economic conditions and buying behavior of consumers, it was clear to me that a shift to online strategy was imminent. As more companies adapted, evolving with customers and technology, we saw more marketing budgets include, if not largely consist of, online marketing tactics. This is what inspired me to jump head first into digital marketing. I’ve been here ever since! A few years ago, I put my Accounting schooling on hold. After the birth of my second daughter, I realized how important it is to show my girls that they can do anything they set their minds to. Accounting is an industry that is grossly under-represented by women, but I’m determined to get my CGA designation. And in the meantime, I’ve been doing finance and administration in the web development and digital marketing sectors, which has helped me keep a pulse on current business trends until I finish my designation. As for my daughters, I hope that when it’s time for them to go off to post-secondary school, they won’t feel discouraged from going into a technical field. I found my path to the digital world by way of online content. I was working as an editor of an online news site when I first learned to embed multimedia content, to edit HTML and to leverage social media as a dissemination tool. It was the first time I was interested in something for more than its political or literary content—I was learning a practical skill that, particularly at the time, wasn’t commonly known or understood by my peers. I was surprised by how much I enjoyed learning a technical skill, and how much I valued the digital world as a platform for creative expression. When I was 12, a family friend offered to teach me how to write HTML code. My parents couldn’t afford to put me in after school programs, so my extracurricular activity selection was limited. I had a few lessons over the course of two months and continued to teach myself once it was over. I fell in love with building websites and design and my hobby eventually led me down the path of a career in digital marketing and tech. Many moons ago, when I was a Psychology student at Western University, I met the owner of TechWyse, DJ Kennedy. I learned a lot about his business and he offered me a summer job handling odds and ends around the office, along with managing our website builder. Between managing template websites and teaching myself graphic design, I became hooked on website development. My summer job turned into a part-time job through school, which turned into a full-time career after I graduated. I was certainly inspired by DJ. He was not only a friend but my boss and mentor. 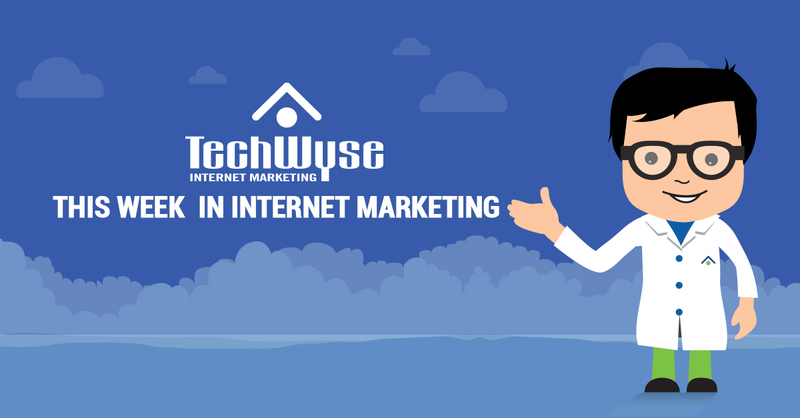 I’ve been involved in many roles and many departments here at TechWyse. My organizational skills and my need to complete every task on my plate before heading home for the day has aided in my growth with the company. Though I’m on mat leave and away from TW for the first time in more than a decade, I make sure to keep my head in the game and keep in touch with my fellow TechWysers. I have not only built a career and some pretty amazing skills, but some life long friends. I was first inspired to get into digital marketing when I took a marketing class as an elective in University. The professor was an inspiring woman with a great depth of knowledge and a style of leadership that I found very motivating. To see someone captivate an entire audience, especially rowdy college undergrads, was mesmerizing. She taught me that gender shouldn’t matter in any profession and shouldn’t hold you back, and that merits should be based solely on skills. I still think back to that class as the source of my early interest in digital marketing. I was an intern at a small agency and my boss did something called “SEO”. I was interested, so he agreed to show me the ropes. The next thing I knew, he said he had a client coming by in a week and he wanted me to present SEO to them which was crazy, since I knew nothing about it! That presentation taught me a couple of things. One – that when I researched SEO, I LOVED the concept and challenge. And two – learning on your own and taking the time to research on your own was the best way to grasp digital marketing. It’s fair to say that since I was young, I’ve always been a tech-savvy individual. It started with Game Boys, PlayStations, Nintendos, NDS, Wiis, PDAs, computers – my brother and I were fortunate enough to have access to a lot of different technological devices. Since then, I’ve delved further into the tech world and am regularly glued to a screen playing video games, or researching the latest phones and devices. I’ve gone so far as to build my own desktop computer. Needless to say, gaming plays a big role in my life and it was probably my key into this field. I did an internship during journalism school in the digital department of an entertainment conglomerate. It was the first place I worked at where the entire team was constantly excited to be at work every day and everyone was equal; there were just as many female bosses as there were males. I knew I wanted to be in a similarly stimulating environment throughout my career, so I left the print media industry and started concentrating my efforts on online mediums. I took the advertising program at Sheridan College, and a major source of inspiration during that time was my Program Coordinator, Peggy Barnwell. In my third year at Sheridan, she encouraged me to open myself up to new opportunities, to become more involved and to take part in more competitions. I soon had the chance to participate in the Cossette ‘grow op’ competition, and our team won the silver medal. This exposure helped me to secure an internship position in Cossette’s Digital department shortly after graduation. I learned quickly during my time at Cossette that I had a true passion for Digital Advertising and I’ve continued my career in the field ever since. Looking back, there was one truly inspirational woman, Peggy Barnwell, that helped me get to where I am today and I will always thank her for believing in me! And last but certainly not least, we want to give a proper shout out to all the talented and bright women working at our international office. We couldn’t do it without you!